Set your sights on New York’s Lake George if you’re thinking of lake homes for rent in the region. Named after British royalty, Lake George has earned a place both in the history books and many a photo album throughout the generations. Part of the lake’s appeal is that while it may only be about three hours from New York City, it feels worlds apart. Nestled in the Adirondack Mountains, in upstate New York, Lake George was carved out of the land by glaciers thousands of years ago. Today, the 32-mile lake boasts deep waters that encircle hundreds of islands and impressive natural formations before cascading down steep rapids and waterfalls to join Lake Champlain. The depth of the lake, along with its incredibly clear waters, supports a unique array of fish and fishing opportunities. Hunt the deeps for prize-winning lake trout and landlocked salmon, which roam between 50 to 180 feet below the surface. Varieties like pike and largemouth bass prefer the light of day, frequenting the more shallow, warmer waters around the lake’s many bays and islands. Don’t worry about the waters getting too cold to hunt on come winter, either: ice fishing is a very popular way to enjoy Lake George. Thomas Jefferson once wrote that “Lake George is without comparison, the most beautiful water I ever saw.” Experience what Jefferson was talking about by spending some time on the lake’s 28,160 acres of stunningly clear water. 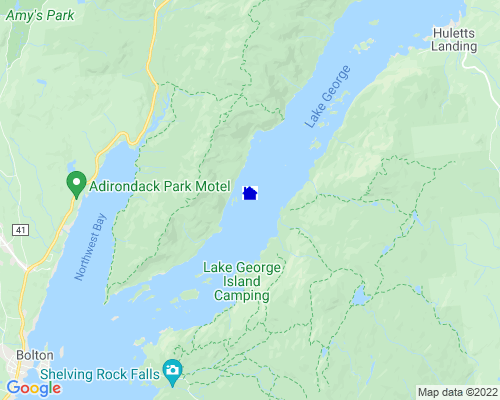 Lake properties for rent are near Lake George’s many public marinas and boat launches, where you’re welcome to rent the water toy of your choice. In addition to hosting the usual boating, jet skiing, and kayaking, the lake is also renowned for its supreme scuba diving to see fish and other unique underwater sights: shipwrecks. Treasure hunters beware: the treasure you find may not be cursed, but it’s certainly protected. Lake George’s 109 miles of shoreline offer plenty of wilderness to explore, and its southern end provides a lively dose of culture and entertainment. Lake-view properties are conveniently located near shopping, museums, and restaurants, along with a number of notable area golf courses. Head to links like Hiland Park, Queensbury, Sunnyside, and Top of the World Golf Course to test your game while never losing sight of the lake. If you’d like to live on a Lake George golf course, visit GolfHomes.com for property listings and details. The lake of Lake George in NY is not only in Ticonderoga, but many townships. It is 32 miles long, and Ticonderoga has the tip. Towns include Lake George, Hague, Diamond Point, Queensbury, Bolton Landing, Silver Bay, Putnam, and Dresden, NY. Lake George, with its crystal clear water and its spectacular scenic views, still impresses the first time visitor much the same way as it must have impressed Father Isaac Jogues in 1642 when he first saw the lake and named it "Lac du Saint Sacrement". Lake George is located in the Adirondack Mountains of New York State, about 60 miles north of Albany. The lake is 32 miles long and dotted with almost 200 islands and it lays in a Southwesterly to Northeasterly direction. Today Lake George is known as one of the premier vacation spots in the Northeast. Many visitors come every year to enjoy the mountains and the sparkling waters of Lake George. But it also has plenty to offer the historically minded visitor as well. The lake, in its present state, was formed by glacier activity thousands of years ago. It is fed, primarily, by underground springs and its outlet is in Ticonderoga. The outlet of Lake George, called the LaChute River descends through a series of rapids and empties into Lake Champlain. A descent greater than that of Niagara Falls. Depth of Lake: 140 ft. The southern end of Lake George known as Lake George Village, is alive with wonderful things to do, including, Lake George cruise ships, many arcades, miniature golf, wax museums, shopping, night life, the famous Fort William Henry Historic Museum and home to what many believe is the most beautiful breathtaking lake in America.